Acme-Hardesty has been in business for more than 74 years. Since 1942, we have been supplying oleochemicals, castor oil & derivatives, and market focused products. We are one of the largest importers, marketers, and value added resellers of oleochemicals and castor oil products in the United States. In 1980, Acme-Hardesty pioneered the Green Revolution by importing and reselling bulk and packaged palm based oleochemicals from Malaysia and Indonesia. Our global supply partners are world class companies who manufacture quality products based on renewable, sustainable and naturally sourced feedstocks. Acme-Hardesty continues to add new products to service our key markets. We focus our sourcing efforts on Green, Natural, Bio-Based, Renewable, Sustainable and RSPO Mass Balance products to meet our customer�s needs. Our customers range from small LTL customers to Fortune 100 multi-nationals. Our parent company, Jacob Stern & Sons, Inc., has been in business for more than 159 years (est. 1857) and continues to be managed by descendants of the founding family. Jacob Stern & Sons is one of the largest processors, marketers and exporters of tallow in the world. 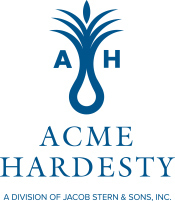 Acme-Hardesty has a long history of providing superior service to our customers. Acme-Hardesty is your partner in global sourcing of Bio-Based & Sustainable products. There is a World of Value & Service behind our Oleochemicals and Derivatives. To exceed our customers' expectations by focusing on chosen markets, continuously improving operations, and challenging our strategies in order to be a world class value added reseller to those we serve.